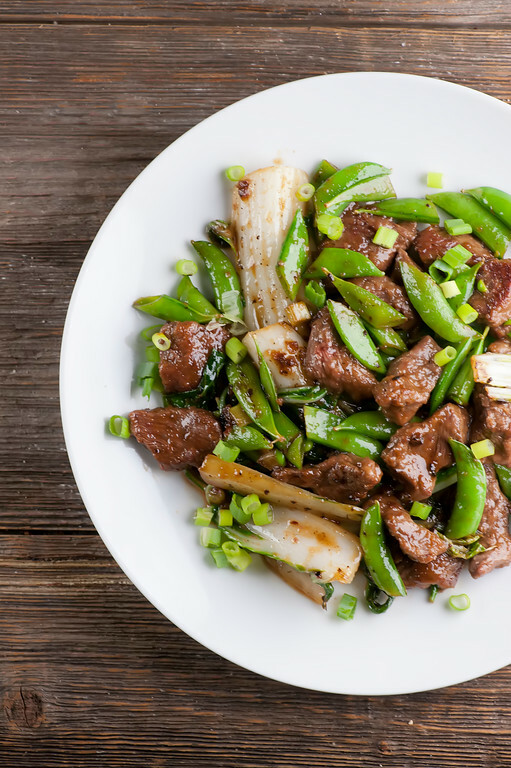 This simple and scrumptious recipe for easy steak stir-fry was born out of two things. First of all, after weeks and weeks of being spoiled by balmy weather here in the Northeast, all of the sudden IT IS COLD. As in, not even the prospect of going to dinner is going to get this girl out of her toasty house and into the chilly car. And second, as much as I like going out for things like stir-fry, I’m always a little skeptical of what is in that stir-fry sauce. While mine has a teeny bit of sugar in it, it’s seriously teeny. Because the stars of this show are the veggies and the steak, and I want the fresh taste to shine through. In the comfort of my nice warm kitchen. Let’s make it! First, let’s talk bok choy. It’s unusual enough that my computer just helpfully auto-corrected it to book chop, which would definitely not be as good. Nope, bok choy is also called Chinese cabbage, and it’s a lovely leafy green veggie that holds up beautifully in stir-fry recipes. I like to get baby bok choy for this recipe, but if your store doesn’t carry that, the regular kind is fine – just cut up a smaller portion. And if your store doesn’t carry bok choy at all, make sure you scold them, and you can use napa cabbage or swiss chard or even spinach instead. There are also various kinds of steak you can use for stir-fry. I love skirt steak for this recipe, but you can also use flank or sirloin – just make sure you slice it into thin slices against the grain so it is nice and tender. You are going to toss the steak with some cornstarch and sear it in a big frying pan until it is just done. Scoop it out and then use the same pan to fry up all the nice green veggies – the bok choy along with some snap peas and some scallions. Once those are done, add the steak back along with any juices, along with some soy sauce, a little water and just a little bit of brown sugar. Stir and toss, stir and toss. A couple of minutes later you will have a lovely plate full of fragrant, good and good for you easy steak stir-fry. Now, you can definitely serve this over a bed of rice, but the Southern husband and I are always pretty happy with it just the way it is. Now go recycle that take-out menu, and stay warm and cozy in your kitchen! Heat 2 tablespoons oil in a large deep skillet over high heat. Toss the steak with the cornstarch and a pinch of salt. Sear the steak until browned (you will need to do this in 2-3 batches) and remove from the skillet. Add the remaining oil to the skillet and add the bok choy. Stir-fry until tender, about 5 minutes. Add the scallion white sections and the snap peas. Stir-fry for another 2 minutes. Add back the steak and any remaining juices and stir. Add the brown sugar, soy sauce and water and stir again until everything is well-combined and hot. Serve at once. I haven’t, but I can tell just from the name that it is something I need to figure out pronto – thanks Shelly! as someone who doesn’t know the first thing about bok choy, i’m delighted by this post! i pass it in the grocery store all the time, and now i might actually pick some up! Do it!! Come on over to the bok choy side! Autocorrect can either be hilarious or fill me with despair. Depends on the day and how tired I am! This looks phenomenal! Can I have it for dinner? 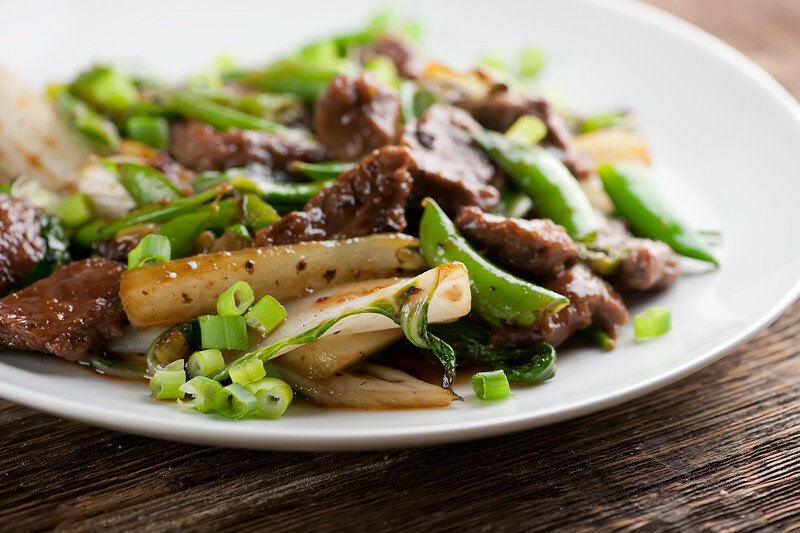 Beef and vegetable stir fry is always a winner! 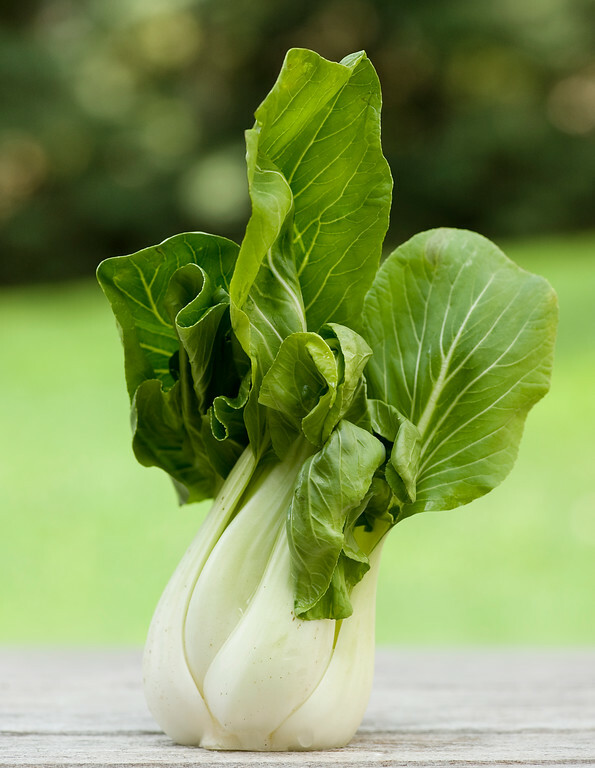 I never added bok choy to stir-fries – sounds like a great idea, I’m going to give it a try! I think bok choy falls into the same category as cilantro, you either love it or you hate it. I’m a lover, and this sounds easy and delicious. Yay for us bok choy lovers! !